Breeding Habitat: Forest edges; coniferous, deciduous, or mixed woodlands (prefers deciduous); gardens and parks. 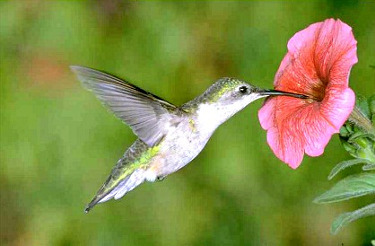 The proximity of nectar plants is a habitat requirement. Males favor edge habitats and gardens. The mated female seeks out a more protected habitat for nesting. Diet: Flower nectar, especially from brightly-colored tubular flowers; small insects and spiders; tree sap from sap wells drilled by the yellow-bellied sapsucker. Note: This plant doesn't flower until the second year. Note: This flower spreads easily by underground shoots, so it is best to contain it with deep edging or by planting in a pot. 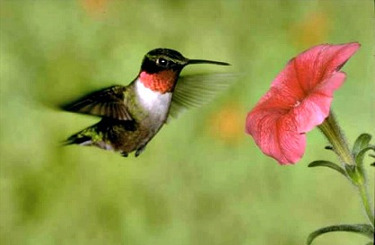 The Ruby-throated Hummingbird breeds throughout New England. Most of these birds migrate to Mexico and Central America in the fall. Some spend the winter along the U.S. Gulf Coast, south Altlantic coast and southern Florida.